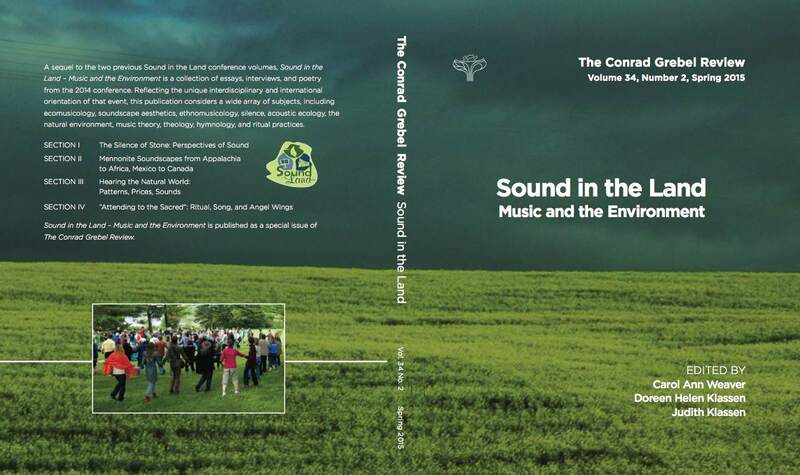 Sound in the Land – Music and the Environment edited Carol Ann Weaver, Doreen Klassen, and Judith Klassen, is available via m2sherk@uwaterloo.ca. The book contains writings from the Sound in the Land – Music and the Environment Conference, 2014, reflecting the interdisciplinary and international orientation of that event, including ecomusicology, soundscape aesthetics, ethnomusicology, silence, acoustic ecology, the natural environment, and rituals. Leading essays are by acclaimed Canadian composer R. Murray Schafer, renowned South African naturalist Gus Mills, and many more. Carol Ann Weaver’s essay, “Notes towards Silence: A Way of Hearing the Earth” (124-132), and an interview with her by Matthew Griffin, “Conversation with Carol Ann Weaver” (119-123) are part of this volume. 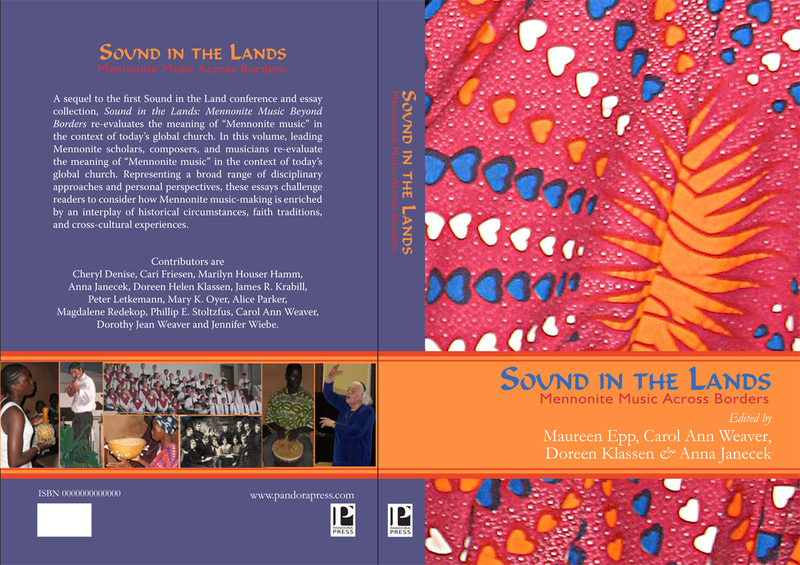 Sound in the Lands – Mennonite Music Across Borders edited by Maureen Epp, Carol Ann Weaver, Doreen Klassen, Anna Janecek, available via Pandora Press, is based on writings from the Sound in Lands conference, 2009, and is a sequel to the first Sound in the Land book. This book re-evaluates the meaning of “Mennonite music” in the context of today’s global church. Representing a broad range of disciplinary approaches and personal perspectives, these essays challenge readers to consider how Mennonite music-making is enriched by an interplay of historical circumstances, various traditions, and cross-cultural experiences. Carol Ann Weaver’s essays, “Preface” (9-11), and “Finding and Receiving Common Song” (179-204) are joined by writings by Cheryl Denise, Cari Friesen, Marilyn Houser Hamm, Anna Janecek, Doreen Helen Klassen, James R. Krabill, Peter Letkemann, Mary K. Oyer, Alice Parker, Magdalene Redekop, Phillip E. Stoltzfus, Dorothy Jean Weaver and Jennifer Wiebe. Sound in the Lands: Essays on Mennonite edited by Maureen Epp and Carol Ann Weaver, available via Pandora Press, based on writings from the first Sound in Land conference, 2005, examines the wide range of musical styles and practices of “Mennonite music” today, ranging from traditional hymns and songs to popular and contemporary forms. Carol Ann Weaver’s essay, “Out of the Cave – Finding Mennonite Sounds in Our Lands” is joined by writings by Mary K. Oyer, Jonathan Dueck, Doreen Klassen, Judith Klassen, Anna Janecek, Jeff Gundy, Di Brandt and more. “Composing in Africa” in Journal of the International Alliance for Women in Music, Vol. 22 No. 1, 2016, 22-23. “Why the Amish Sing: Songs of Solidarity and Identity – a Review” in Mennonite Quarterly Review, Vol. LXXXIX, No. 3, April, 2015, 496-498. “Tapping the Furnace: Music by Dorothy Hindman” in Journal of the International Alliance for Women in Music, Vol. 21, No. 1, 2015, 44-45. “Sing my Heart, Joyful Art” in Vision Magazine, Fall 2014, 60-68. “Leap into nothing, joyful, or, Dancing with the Dead.” by Di Brandt, Rebecca Campbell and Carol Ann Weaver in ReGenerations – Canadian Women Poets in Conversation (2005), Barbara Godard, Di Brandt. Toronto: Black Moss Press, 129-148. “Women’s Worlds 2005, Embracing the Earth – East-West, North-South” in Journal of the International Alliance for Women in Music, Vol. II, No. 2, 2005, 53-54. “Themes in Women’s Music ­– Consciously Feminine?” in With a Song in Her Heart: A Celebration of Canadian Women Composers (1995), ed. J. Drakich, E. Kovaric, R. Lumpkin. Windsor: University of Windsor Humanities Research Group, 69-76. “When Two Plus Two is More Than four: A Saga of Collaborations” The Grebel Review, Vol. 16, No. 3, Fall, 1998, 110-119. “Kenyan Women’s Music: An Agent of Social and Cultural Change” MUSICWORKS 61, 1995, 8-19. “Kenyan Women’s Music as a Possible Agent of Social and Cultural Change” The Conrad Grebel Review, Vol. 12, No. 2, Spring, 1994, 113-130.